Groundforce Shorco have made a small but significant contribution to CIRIA’sGuidance on embedded retaining wall design (C760). The recently issued document replaces the previous C580 guidance, and will provide a comprehensive Eurocode compliant design manual for embedded retaining walls. CIRIA is the construction industry research and information association, a neutral, independent and not-for-profit body, linking organizations with common interests and facilitating a range of collaborative activities that help improve the industry. 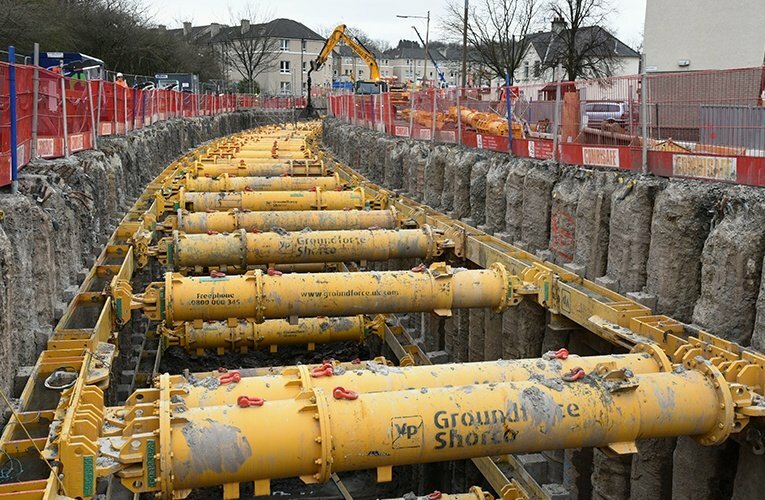 Groundforce Shorco, who are renowned for being at forefront of developing new and best practice engineering solutions in excavation support, were invited to part fund and contribute to the new guidance document based on their experience in this specialised field of engineering. The information they supplied included specialist design guidance on the application of Eurocodes to the design of long span proprietary props including recommendations for thermal loading effects from prop load monitored case studies. Tony Gould, Groundforce’s Technical Director said: “The new document provides a wealth of best practice and specific design guidance on the selection and design of embedded retaining walls to satisfy the requirements of the Eurocodes. It covers both temporary and permanent situations for cantilever, anchored, single and multi-propped retaining walls that rely on embedment in a variety of commonly encountered ground conditions for full or partial support. C760 also addresses the technical and construction issues relating to the selection of appropriate wall types and construction sequences to achieve a satisfactory solution. It also clarifies areas of ambiguity and common misunderstandings when applying the Eurocodes to the design of embedded retaining walls and presents a clear, unambiguous method for the application of observational methodology to retaining wall design." C760 is available to purchase or download from the CIRIA website: http://www.ciria.org/ItemDetail?iProductcode=C760.